We are fortunate E2W member Helen Bevis, Head of Pre Sales EMEA, NICE Actimize, is hosting and leading the discussion ‘Behavioural Analytics - The next frontier of surveillance’. To what extent is Behavioural Analytics being adopted by companies? How is this impacting within company departments? What does this mean for technology? What does this mean for roles within the industry? Behavioral analytics is a recent advancement in business analytics that reveals new insights into the behavior of consumers on eCommerce platforms, online games, web and mobile applications, and IoT. The rapid increase in the volume of raw event data generated by the digital world enables methods that go beyond typical analysis by demographics and other traditional metrics that tell us what kind of people took what actions in the past. Behavioural Analytics platforms incorporate a wide range of data including trade, P&L, communications and HR information. This enables firms to measure a diverse set of behavioural factors such as trading outside of normal hours, daily P&L, method of communication and call duration. Holistic Behavioural Analytics then establishes a profile of normal behaviour across each factor for an entity and deviations from normal behaviour for each factor are calculated and a risk score assigned. 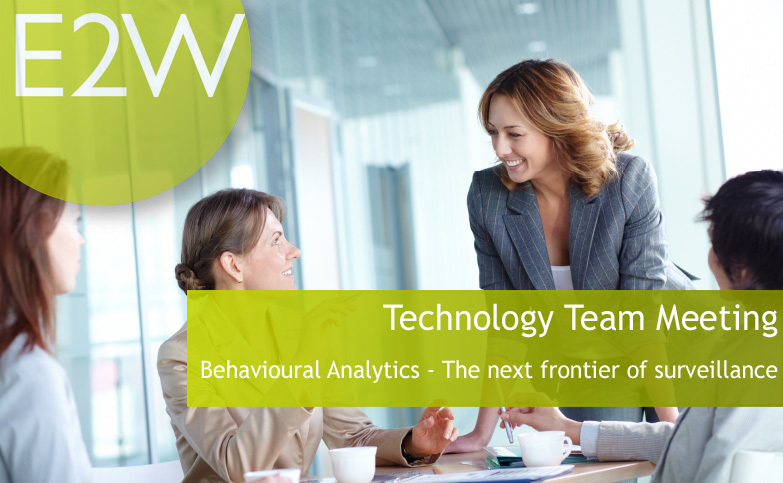 To learn more about Behavioural Analytics, share your experiences, and connect with like-minded Tech team members please register for this event.